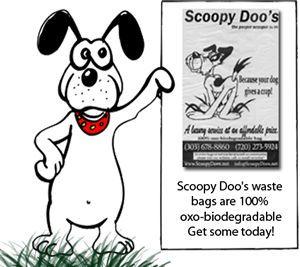 Scoopy Doo’s has been providing the best professional dog waste & poop scooper services for both residential, commercial, and HOA clients in Longmont, Boulder, Niwot, Firestone, Frederick, and the surrounding communities since 1993! We offer a luxury pet service at a very affordable price. Our small team of pooper scoopers are courteous, thorough, and very reliable. We are experienced in befriending dogs of all breeds and ages, so your pet always feels comfortable and not threatened by our presence while we’re performing our residential dog poop removal services. We are trustworthy, and have a long list of satisfied customers in Longmont, Boulder and the surrounding communities. Our commercial & HOA customers really appreciate the fact that we systematically remove dog waste from the entire grounds, and ensure that all dog poop has been removed after each and every visit. Over the last 20+ years, we have built our business on personal referrals by our satisfied customers in Longmont, Boulder, Niwot and the surrounding communities. As a result, we have a $25 cash referral program for every new client referred to us that results in new business. We 100% guarantee your complete satisfaction, or we will make it right for you! Also, check out our customer reviews page, and our Google reviews! Regular Maintenance, Clean-up, and One-time services. We personally take care of your dog’s business, so you don’t have to. Let us take a load off, contact us at 303-678-8860. I have been very happy with everything about Scoopy Doo's. They are professional, friendly and provide a much needed service at a fair price. I like the way they leave a little treat for my dog. More importantly, at my request, they call me to let me know when they are on their way. I have a rescue dog who is apt to dart out if the gate is opened, and the phone call gives me time to bring my pup inside. Once you try Scoopy Doo's, you will not know how you managed before!